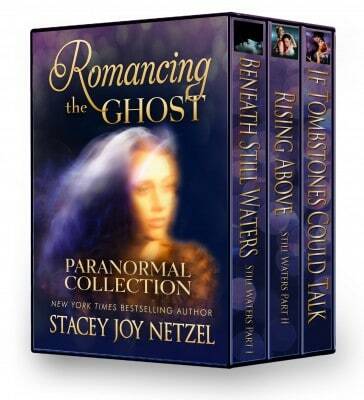 NY Times & USA Today Bestselling author Stacey Joy Netzel presents a collection of three haunting paranormal romance stories set in the beautiful Rocky Mountains of Colorado that will tantalize your imagination. BENEATH STILL WATERS (Part One): An old legend tells of a beautiful witch unjustly persecuted who became a ghost bent on revenge… The danger lies in not believing. RISING ABOVE (Still Waters Part Two): Imagine you’ve lived before, but don’t remember or believe it’s even possible. Therein lies the danger. For in not believing and learning from your pasts, the power shifts to the one who would see you dead. Again. IF TOMBSTONES COULD TALK: Andrew Lindeman is shocked when Melanie Sparks can see and hear him after more than a century of helplessly watching the world pass by. When she learns his tragic story, she vows to clear his tarnished name, not realizing that in setting his spirit free, she could lose him forever.